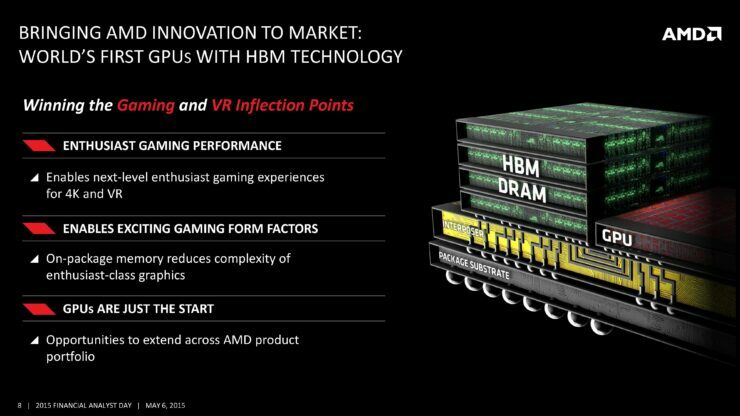 AMD unveiled several interesting products and chips yesterday, during their Financial Analyst Day presentation. 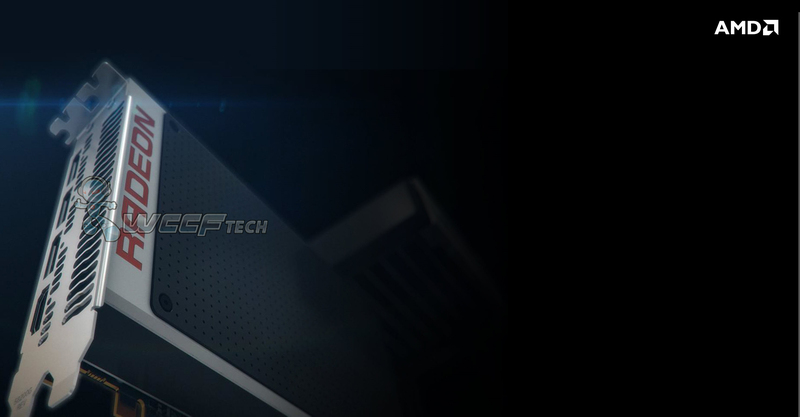 What AMD didn’t wanted to display during the conference was a surprising picture of a graphics card which we can confirm is based on AMD’s flagship graphics processing unit, that will be codenamed Fiji. Since we posted the teaser image of the flagship graphics card, several rumors based on the naming scheme and Radeon 300 series family have appeared and this post will try to clarify most of the things which AMD didn’t reveal at the conference. So let’s talk about a few things we covered yesterday before moving to the new set of details. 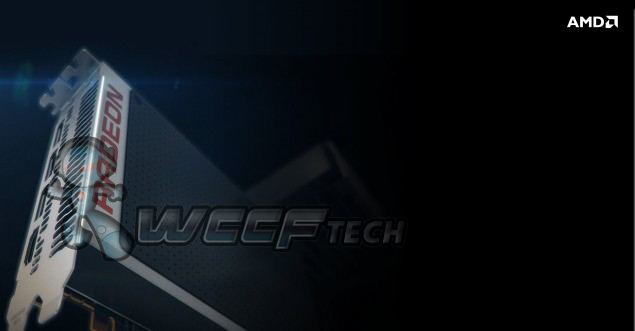 First of all, we covered some official details regarding GCN about how the next generation graphics processing units will help leverage AMD’s position against NVIDIA in terms of performance and energy efficiency. The details start off with AMD talking about several key features that will be introduced on their Radeon 300 series family of cards that include High-Bandwidth Memory (HBM) implementation, DirectX 12 optimizations, VR features and boost through LiquidVR API, 4K capable processing power in games and support for Freesync technology. These key details are something we have known for a while and it’s easy to expect these features adopted by AMD’s next generation cards. AMD also mentioned that since the launch of GCN, it has been fine tuned to meet graphics demand for next generation gaming titles and compute scenarios. In this case, we are looking at new and enhanced Asynchronous compute engines, more efficient and scalable architecture designs that are optimized for graphics and parallel compute. 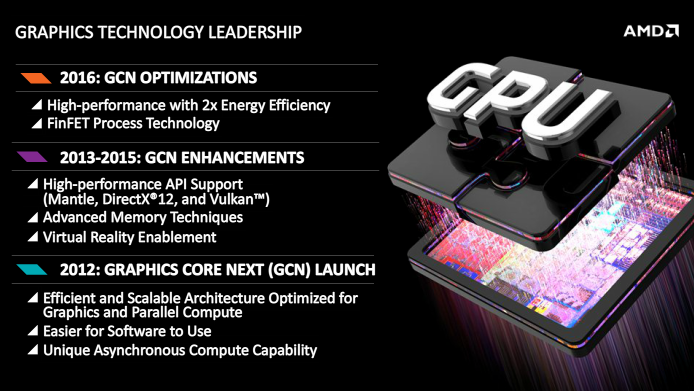 The latest iteration of GCN architecture will adopt the latest API standards that include DirectX 12, Vulkan and Mantle. They will be the first cards to feature advanced memory techniques such as HBM which is a deal changer in terms of GPU design schemes and finally, allowing virtual reality enablement. Of course, we can’t really say anything else beside the information provided since that is all AMD wanted to share at the moment and the next update will probably arrive in the next couple of weeks when AMD decides to launch the cards during this quarter. 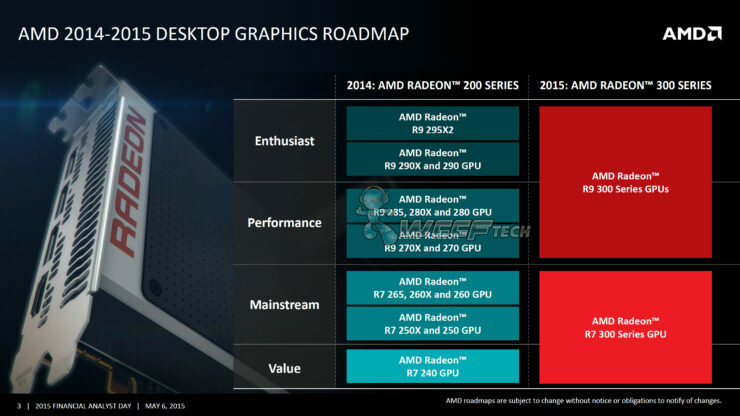 The roadmap AMD displayed during the presentation includes the Radeon 200 series family for their 2014 graphics card lineup. This was made up of several cards which include Hawaii based Radeon R9 295X2, 290X, 290, Tahiti based Radeon R9 280X and R9 280, Tonga based Radeon R9 285, Pitcairn based Radeon R9 270X, R9 270, R7 265, Bonaire based Radeon R7 260X, R7 260, Cape Verde based Radeon R7 250X and the Oland based R7 250, and R7 240. So what are we looking at next? The Radeon 300 series family is going to replace the Radeon 200 series cards from top to bottom. The series will include several cards based on new and older chips. As pointed in the roadmap, the Radeon R9 series will replace the enthusiast and performance offerings with new cards based on Fiji, Hawaii and Tonga chips. The mainstream and value lineup which are part of the Radeon R7 300 series family will replace the entry level and budget tier offerings. 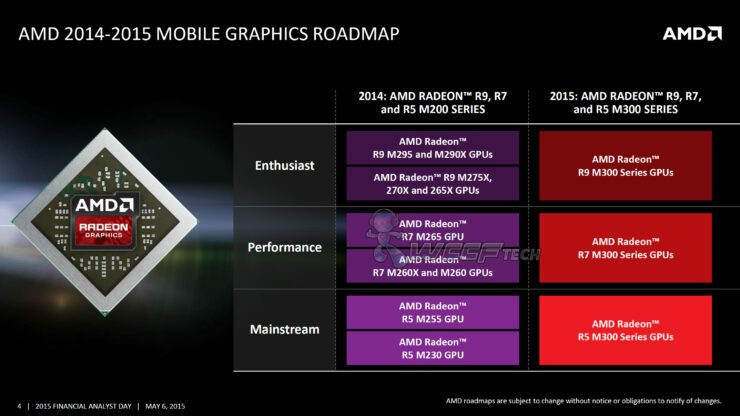 Now there has been some confusion regarding the OEM Radeon 300 lineup and the consumer lineup. The OEM lineup will include cards that will only be shipped to OEM PC manufacturers such as Lenovo and HP. These will include some cards that will be a part of the Radeon 300 series family (Non-OEM) but there are several irregularities with the branding scheme. 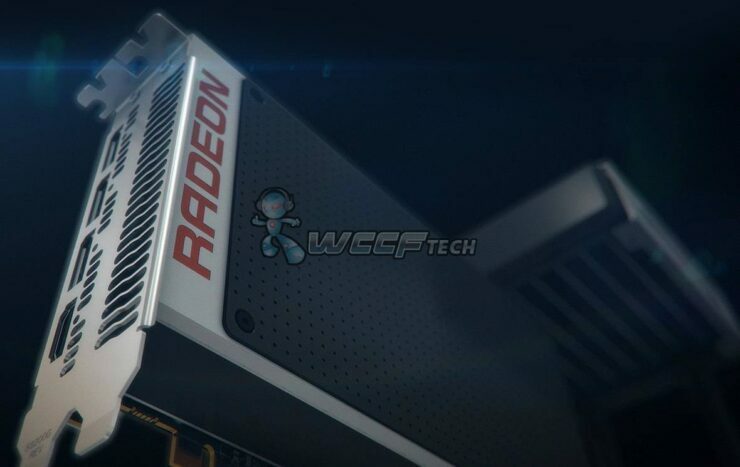 For instance, it has been confirmed that the Radeon R9 360 is an OEM part however the non-OEM consumer version will be labeled appropriately as the Radeon R7 360 graphics card that makes perfect sense. Secondly, AMD’s OEM 200 series and 200 series lineup has also existed before in parallel and included some cards that weren’t part of the official lineup such as Radeon R9 255 and Radeon R9 275. The lineup also didn’t feature any R9 280 series cards that left a big gap between Pitcairn and Hawaii in the OEM lineup. This simply confirms that the OEM lineup will exist along side the non-OEM discrete lineup. According to official sources, we can independently confirm that the next AMD series will be part of the Radeon 300 series family. Our technical writer, Khalid, covered a very interesting story about the AMD Radeon R9 390X yesterday which gave us a first teaser at not only the card but the Fiji GPU too which is absolutely fantastic. 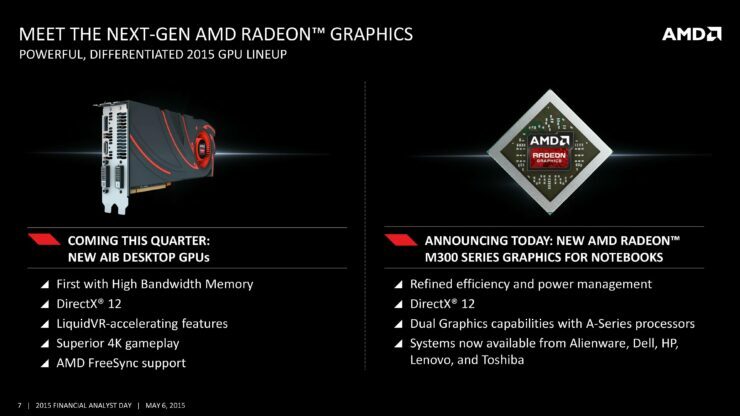 The second update that AMD gave was a slight glimpse of their next generation graphics processing unit. Sure, we don’t know anything about it but the details they revealed simply point to a greater update to the GCN core architecture by building a design on the latest FinFET process. The smaller process along with GCN updates lead to a 2 times the performance per watt efficiency with the next generation graphics card featured in the Radeon 400 series family. The cards will incorporate the latest 3D HBM technology which will allow die stacking on both the interposer and the GPU die itself leading to higher VRAM capacities at far greater speeds. These key techs will shape AMD’s graphics lineup for 2016 and we can expect a good update to the entire product portfolio that won’t be based on rebranded chips. Last but not least, there might be a fake render based upon the official image we covered yesterday, roaming around the net. The render which is nothing more than a photoshop effort towards the real card has several errors which are explained in a different article. There are several details being misinterpreted in the wrong way about the upcoming cards by various sites and hence we advise you to take them with a grain of salt. The cards will be on market shelves in the upcoming weeks and most probably during the E3 event being hosted by AMD where PC Gaming site “PCGamer” along with several PC centric game developers will be showcasing new technologies and game engines powered by AMD’s new cards. The next lineup will be part of the Radeon 300 series family and there’s enough evidence to support this claim.